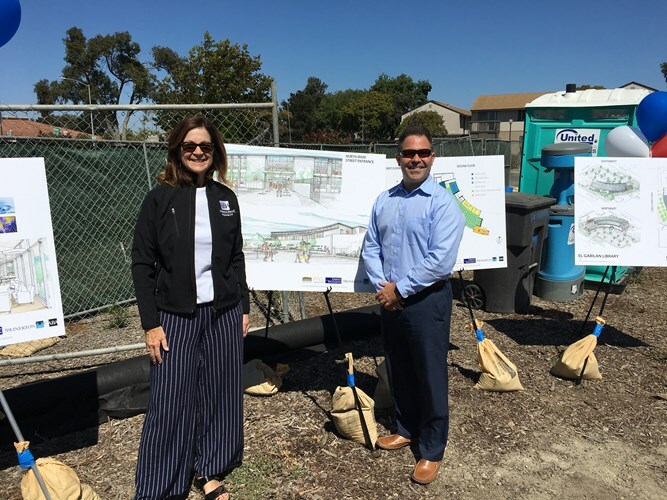 Anderson Brulé Architects’ newest library project hit a milestone on September 10 with its groundbreaking ceremony that took place at the City of Salinas’ El Gabilan Library site. ABA Principal Pamela Anderson-Brulé and Associate Principal Jason Hull were recognized for designing the project. Cary Ann Siegfried, Director of Library and Community Services, welcomed City Manager Ray Corpuz; Mayor Joe Gunter, Councilwoman (District 4) Gloria De La Rosa; Vice Chair Albert Fong of the Library and Community Services Commission; and President Ken Allen of the Friends of the Salinas Public Library. Also, in attendance were students of El Gabilan Elementary and their Principal, Ms. Esabel Cervantes. Salinas’ new El Gabilan Branch Library will be a two-story, 21,000 SF library and learning center – replacing the City’s ageing branch constructed in the 1960’s. It is the city’s vision that the El Gabilan Library be a safe, accessible and inclusive community place for all ages. It will also promote curiosity and have an innovative approach to life-long learning, providing limitless possibilities. To support the vision, the library will include diverse spaces supporting its library collections and programs: tech/maker space, various sized meeting rooms, quiet study space, digital studio, children’s story time area, teen area, community room with kitchenette and storage, second floor reading deck, and a backyard with exterior gardens, patios, and learning areas. The library’s design concepts include transparency; simple forms that mimic the concept of embracing community and culture; strong indoor/outdoor connection; visually dominant nature theme; and a visual presence from Main Street. ABA facilitated extensive community outreach which started in 2016 reaching over 1,000 community members and included surveys, community meetings, pop-up kiosks at local events, and focus groups. The building design started in summer 2017 and library doors are to open in early 2020.